1. 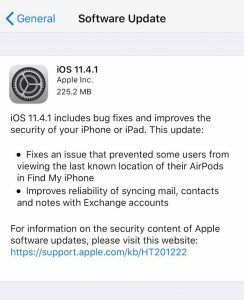 Fixes an issue that prevents some users from being able to view the last known location of their AirPods in the “Find My iPhone” app. 2. Improves the reliability of syncing mail, contacts and notes with Microsoft Exchange accounts. 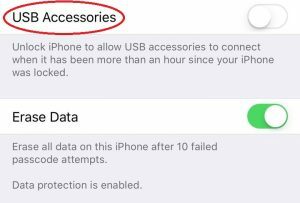 While the first two updates are mostly self-explanatory, USB Restricted Mode stems back from an incident in 2016 between Apple and the FBI over the San Bernadino terrorist shootings. Apple refused to build a “back door” to their software that would allow the agency to bypass their security. Apple feared that this vulnerability in their software would be exploited with malicious intent. USB Restricted Mode is enabled by default when you update to iOS 11.4.1, but can be toggled off if necessary. Apple’s wording seems a bit confusing but you should leave the toggle disabled if you want your iPhone to be most secure. Apple iOS 11.4.1 is available on all eligible devices in the Settings app. To access the update, go to Settings –> General –> Software Update. Eligible devices include the iPhone 5s and later, the iPad mini 2 and later, the iPad Air and later, and the 6th-generation iPod touch. If unsure your device is eligible just navigate to the Software Update section on your device and see if the new update is accessible. The OIT department recommends that you take the time to update your eligible Apple devices, both company and personal. If you require assistance with the update or in general navigation on your Apple device, please do not hesitate to contact the Help Desk either by email, [email protected], or phone number 215-854-7067.